Trucks on hold, a partnership between Volkswagen and Ford, a potential saving grace for the thought-to-be-doomed Cadillac CT6, more jail for former Nissan chairperson Carlos Ghosn, and struggles at Fiat Chrysler’s Canadian plants. All of this and more in The Morning Shift for Tuesday, Jan. 15, 2018. 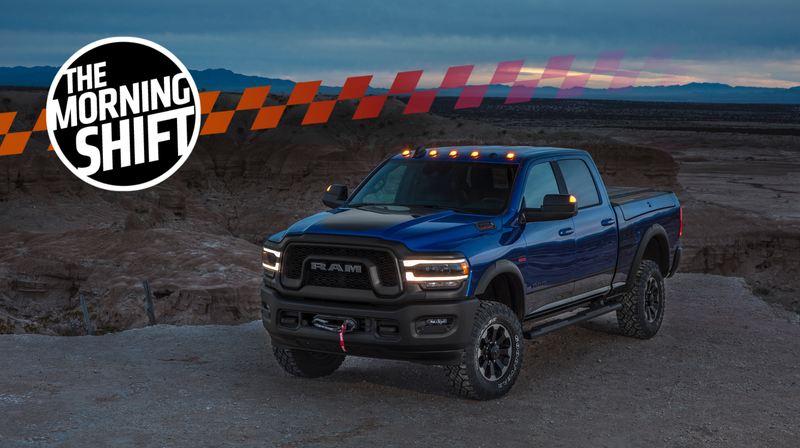 The 2019 Ram Heavy Duty 2500 and 3500 trucks debuted at the Detroit Auto Show on Monday, climbing to the top of the never-ending torque wars among U.S. truck manufacturers once again. But that’s not the only battle they’re in the middle of, since Bloomberg reports that Fiat Chrysler CEO Mike Manley said the U.S. government shutdown could delay the trucks’ launch. The trucks, which FCA rates top engine trims at 1,000 lb-ft of torque and towing capacities of 35,100 pounds, may not come onto the U.S. market as soon as the company wanted. In addition to creating chaos in our daily lives, the shutdown is making things run behind, according to Bloomberg. FCA’s big holdup is that it’s still waiting on emissions certifications for the new 3500 from the U.S. Environmental Protection Agency so that the truck can be approved for sale, but Manley said the shutdown is holding it all up. Bloomberg reports that the partial federal shutdown has “idled the EPA” and its Office of Transportation and Air Quality. The office tests vehicle models and confirms that they comply with federal emissions regulations, which they have to do before automakers can sell them. Without the office running at full speed to do the testing, launch delays are looming. With how quickly American trucks try to one-up each other in torque numbers, who knows—another company may come out with 1,001 lb-ft during the delay. 2nd Gear: The Cadillac CT6 May Actually... Live? Here’s a weird one: In a part of the world where sedans are dying at the hands of crossovers and SUVs, Automotive News reports that the Cadillac CT6 sedan, scheduled to end production for the U.S. market a few months from now but stay alive in China, may not actually die over here. Apparently, Cadillac wants to try its best to keep the CT6 alive in America. The whole thing about its death being a guarantee with the “end of production” on June 1 of this year comes down to a miscommunication. Automotive News reports that GM President Mark Reuss and Cadillac President Steve Carlisle said on Monday that the company is looking at options to keep the CT6 alive in the U.S. after its plant’s closure. Options include moving production elsewhere or importing from China, since it’s also made there, but Carlisle said the imports “would be the least-preferred option.” It’s no wonder why. Carlisle said production of the car will be part of the company’s upcoming negotiations with the UAW, which has opposed the potential plant closures. The current four-year contract between the automaker and union ends in September. Automotive News reports that Carlisle and Reuss said the CT6 wasn’t meant to be fully on the chopping block with other GM sedans, but that “officials at the time did not communicate those plans.” Huh. Alright. It makes sense for Cadillac to not kill the CT6, since it debuted in 2015 and the MSRP on its new V-badged performance version came out this week. But it’s also weird that such a major apparent “miscommunication” went unaddressed for nearly two months after the news came out in November. Either way, when asked about the CT6 in general and its death by Jalopnik on Monday, a Cadillac spokesperson didn’t wave a big “The CT6 isn’t dead” flag. In what the automakers somehow managed to hold themselves back from calling a “dynamic duo,” since automakers love the word dynamic, Ford and Volkswagen announced Tuesday that they’re partnering up on trucks and vans. The pairing doesn’t involve cross ownership between the companies, they said. Ford and Volkswagen want to build commercial vans and medium-sized trucks “for global markets,” the announcement said, and they want to deliver the first trucks in 2022. Vans will follow, with Europe being the target market, and the companies also agreed to “investigate” teaming up on autonomous cars. The pairing will be overseen by a committee with executives from both companies. The partnership makes sense and is a common thing to do, since working with another company means sharing some of each other’s information, data and resources to make development easier and cheaper for both. It’s a win-win type of deal, for the people making the vehicles. Volkswagen CEO Herbert Diess also said the partnership will “improve” the companies’ competitiveness, meaning customers may see some savings, too. Though they probably won’t. We are long, long past the days of savings being passed on to customers. The savings will be passed on to golden parachutes. We often dedicate a small part of our mornings to checking in on former Nissan chairperson Carlos Ghosn, who’s in a detention center in Japan over his alleged financial misconduct. The update of the day is that Ghosn’s staying in the center awhile, because request for release on bail was denied. The Wall Street Journal reports that the Tokyo District Court denied Ghosn’s ask, meaning he could stay locked up for months awaiting his trial, and that his lawyer is appealing the decision. Ghosn’s been in jail since Nov. 19, when all of this came out. In the meantime, the Nissan-Renault alliance hasn’t been going too well, since Nissan brought the allegations and removed Ghosn as a chairperson while Renault kept Ghosn on as its CEO. Mr. Ghosn has been charged with understating his compensation on eight years of Nissan’s financial reports and with causing Nissan to pay the company of a Saudi Arabian friend who helped him with a personal financial problem. The latest charges were filed on Jan. 11 and cleared the way for Mr. Ghosn to seek his release on bail. Mr. Ghosn says he is innocent. He says he kept a record at Nissan of how much he thought he was worth but that it was hypothetical and didn’t bind Nissan to pay him anything beyond his publicly reported compensation. He says Nissan received valuable services from the Saudi company and paid it appropriately. The Wall Street Journal reports that Ghosn’s lawyer estimates a trial to be about six months away, meaning, if the appeal doesn’t work, he’ll be in the detention center for quite a long time waiting for the day to come. The plants are the Windsor and Brampton locations, both in Ontario, with the Windsor plant building the Chrysler Pacifica and Dodge Grand Caravan while Brampton builds the Chrysler 300, Dodge Challenger and Dodge Charger. Bigland said the automaker has been “committed to Brampton” for a long time and that shouldn’t change soon. But with all of the General Motors closures and job losses in the current car market, it’s hard not to think the worst. Elisha Otis patented the first steam-powered elevator on Jan. 15, 1861, according to the Encyclopedia Britannica. His patent was for a controlled steam engine for elevator use, and, according to the encyclopedia, the invention laid groundwork for what would become the Otis Elevator Company. Otis died a few months after the patent, so, according to the encyclopedia, his two sons took over the business. Neutral: What Do You Think About the CT6 Staying Around? Honestly, the prolonged life of any sedan is welcome news, in this market.